On May 20th, Oklahoma City and its suburbs were hit by a devastating tornado. According to the latest news reports, the mega-tornado killed at least 24 people, nine of them children. My prayers go out to those whose lives have been affected by this terrible tragedy. While the situation is clearly an emotional one, we can’t let our emotions get away with us when it comes to understanding the science behind this tragedy. This is climate change. We were warned about extreme weather. Not just hot weather. But extreme weather. When I had my hearings, when I had the gavel years ago. It’s been a while. The scientists all agreed that what we’d start to see was extreme weather. And people looked at one another and said “what do you mean? It’s gonna get hot?” Yeah, it’s gonna get hot. But you’re also going to see snow in the summer in some places. You’re gonna have terrible storms. You’re going to have tornadoes and all the rest. We need to protect our people. That’s our number one obligation and we have to deal with this threat that is upon us and that is gonna get worse and worse though the years. She then went on to talk about a bill she has sponsored. It would put a tax on carbon in hopes of moving people to alternative sources of energy so as to reduce the effects of “climate change.” While Senator Boxer’s words are an emotional call-to-arms, they fly in the face of the scientific evidence. The number of EF1 or stronger tornadoes in the U.S. from 1954 to 2012. Do you see a trend there? I most certainly do not. Since 1954, the concentration of carbon dioxide in the atmosphere has increased dramatically. If tornadoes can be linked to carbon-dioxide-induced climate change, why hasn’t the number of tornadoes increased during that same time period? 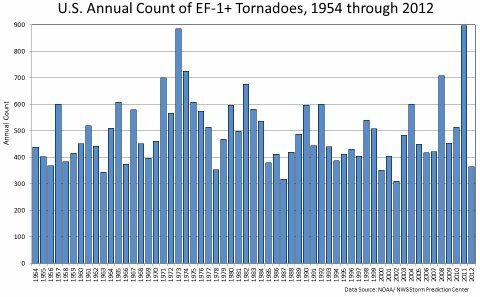 The number of EF3 or stronger tornadoes in the U.S. from 1954 to 2012. 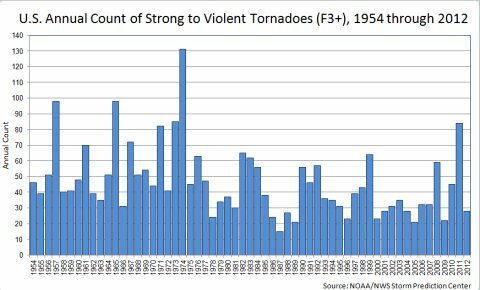 If anything, then, the data indicate that the supposed “climate change” that is going on is decreasing the number of violent tornadoes in the U.S.! Now, of course, I don’t think there is any connection between the two. My point is that if anything, the data say precisely the opposite of what Senator Boxer claims. Now, of course, the fact that a politician doesn’t bother to investigate the scientific data regarding tornadoes doesn’t surprise me. In fact, it is simply part of a pattern: When something bad happens, blame it on the currently-fashionable scientific crisis, no matter what that crisis is. Last April, in the most devastating outbreak of tornadoes ever recorded, 148 twisters killed 300 people and caused half a billion dollars’ worth of damage in thirteen U.S. states. To scientists, these seemingly disparate incidents represent the advance signs of fundamental changes in the world’s weather. In other words, back in 1975, severe tornadoes were the result of “global cooling.” Now that we have switched to a new crisis, people have simply switched the blame for tornadoes from “global cooling” to “global warming” (AKA “climate change”). If we ever want to have sane policies regarding the environment, we need to have politicians that actually investigate the scientific evidence rather than just blaming every bad thing that happens on the currently-fashionable scientific crisis. Unfortunately, I seriously doubt that will ever happen. What a timely article! Thank you Dr. Jay! I really appreciate this kind of article because it gets so…tiring to hear the other side ALL the time. I know what I believe, and I don’t believe in extreme climate change. But it’s good when someone affirms your stand who is a lot more knowledgeable than yourself!